It took Tommy Mace a while to remember the last time he threw a complete game. He guesses it would be at some point during his senior season of high school but that’s only seven innings. When Mace finished the seventh inning on Friday night he had already thrown 91 pitches. 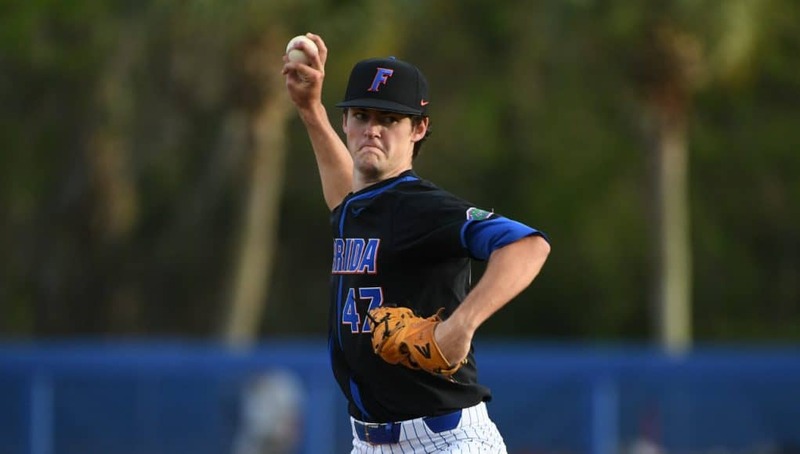 So for the first time in his life Mace went out to the mound in for the eighth inning in a game he started and he would finish a three-hit, one run masterpiece with seven strikeouts to help the Gators win the game, 3-1. Mace has been as solid as he could possibly be the last two Friday nights but was saddled with losses due to bad defense and not hitting. 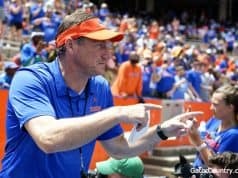 The Gators 1-5 record in conference play wasn’t the start they wanted and this third series of the season is about as must win as a series can be this early in the year. 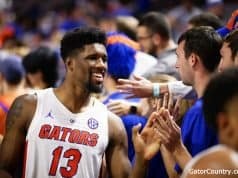 The Gators didn’t play a perfect game, far from it, but the cards fell for them. In the fist inning Jacob Young walked on four pitches to start the frame. Young took off for second and Brady McConnell grounded out to shortstop. It looked like a hit-and-run call had saved a potential double play but Kevin O’Sullivan told reporters after the game he didn’t have a hit-and-run on or even a steal. It was a missed sign but it worked out. Young stole third and scored when Nelson Maldonado grounded out. Alabama scored it’s lone run in the third inning but it was more on the defense than on Mace. T.J. Reeves singled with one out and Mace hit Kobe Morris in the foot with a cutter. The sophomore pitcher got a tailor made double play ball but Young’s throw to first pulled Kendrick Calilao off the bag to give Alabama runners on the corners with two outs. The next batter, Kolby Robinson, grounded up the middle but Brady McConnell snagged it and flipped to second for the final out, until the call was reversed after review, which scored the tying run. 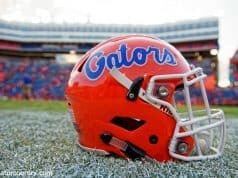 The Gators would pull back ahead in the fifth inning. Young led off with a double to center and moved to third on a McConnell single. Nelson Maldonado drove Young in with a single of his own and McConnell scored one batter later when Calilao grounded out. The offense did just enough with three runs and seven hits but the story of the night was Mace. The sophomore was sensational. Florida will send Tyler Dyson to the mound looking for their first SEC series win of the season on Saturday at 6:30.